When building a flow with a peak pose like Headstand, you really need to make sure you have thoroughly warmed up the specific body parts involved without tiring them out. For example, the shoulders and core need to be warm and engaged, but spending 20 minutes doing Vinyasas will simply tire out the upper body, making your Headstand wobbly. Here are a few tried and true mini flows to help build a sequence around Headstand in your own practice! These flows will both strengthen and prepare your body for the hold and they are easy to insert midway into any flow. Always make sure to stretch your entire spine, specifically your neck, post-Headstand and try to take a twist of some kind to relieve the spine. This flow is both strengthening and stretchy. It requires all of your concentration to stay balanced and is the perfect preparation for a Tripod Headstand after some Sun Salutes or Side Plank variations. Take Plank for 5 breaths to ignite your core and shoulders. Move into Down Dog to stretch out your back. Walk your feet to meet your hands for Ragdoll and stretch out your neck. Uncurl up to Mountain Pose with the arms reaching overhead, and stand on your toes -- squeeze your ankles, thighs, belly, shoulder blades, and arms into your midline. Test your balance for 3-5 breaths. This simulates the activity you need in your whole torso and both legs for your headstand. 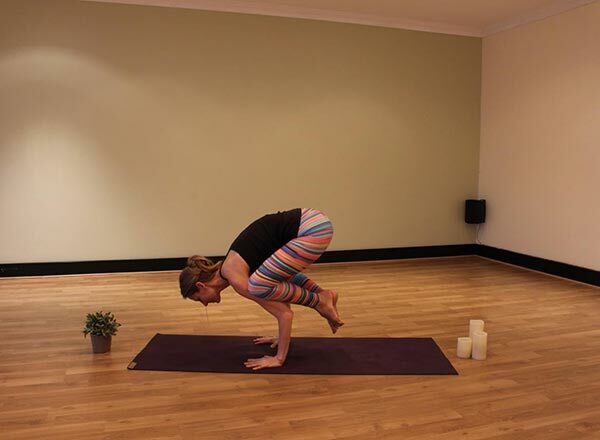 Come to our first bird, Hummingbird Pose, by staying on your toes and bending at the knees in Chair Pose. Squeeze your ankles, thighs, and core in. Move your arms back behind you in airplane arms, using your core and thighs to hold you up. Lower into our second bird, Sparrow Pose, by interlacing your fingers behind your back, and, still on your toes, begin to drop your head and chest down into a deep Forward Fold. Still on your toes, raise your arms up to the ceiling and push them forward toward the front of your mat. This stretches out your arms and shoulders. Hold for 5 breaths. Press your hands into the mat and take our third bird, Crow Pose with feet on the floor or raised, setting you up for your Headstand. From Crow, rise up to a Tripod Headstand, and squeeze your shoulders, elbows, core, thighs, and ankles. Hold here for 5 breaths. See if you can lower back down to Crow Pose. Step or float back to Low Plank and lower down to stretch out in a long Cobra Pose before sliding back into a Twisted Down Dog. A simple way to lead into your Forearm Headstand, based mostly on strength and shoulder ignition. Pop this flow in at the end of the balance series when you have been off of your arms for a while. Start in Child's Pose to stretch your spine and neck. Next take Dolphin Pose for 3 breaths, squeezing your elbows towards each other and lifting your shoulders away from your ears. Knees can be bent or straight. Lift one leg straight up with your toes fanned out to ignite all your leg muscles, and rock high on the toes of your standing foot for 3 breaths, lifting higher with every inhale. Take Forearm Plank for shoulder and core strength, squeezing your thighs together to ignite your legs. Use Sphinx or Cobra to help open your clavicle and relax your shoulders before your headstand. Come back to Forearm Plank and into Dolphin Pose to set up for your Forearm Headstand by squeezing your elbows towards each other, pulling your belly in, and lifting to the Headstand. Stay for a minimum of 5 breaths. Come back to Dolphin Pose and walk back to Forearm Plank. Lower to the ground and use Sphinx or Cobra to stretch it all out. Slide back to Child's Pose to rest and lengthen your neck. Rock your head and hips side to side to loosen your neck muscles, then end with Thread the Needle to twist it all out. From a Wide Legged Forward Fold press up into a Forearm Headstand or Tripod Headstand, then bring your feet back to the mat with ankles touching for a Forward Fold with your feet together. From Ardha Utanasna (your “flat-back” 90 degree hold), fall forward into a Down Dog with your elbows bent, squeezing into your ribs. Push the mat away with your hands and float back up to Ardha Utanasana. Repeat 3 times to engage your core and warm up your shoulders, then on the last one, place your head on the ground and lift your legs into a Tripod Headstand. Lower your feet back to your mat and press up to Ardha Utanasana. Take Ragdoll Pose to relax. Have fun, and remember to always warm up first! Did you try any of these short flows? Let us know how it went in the comments below!